Asus Zenwatch 3 is a refined Android Wear smartwatch with one of the best display compared to most other similar watches. It's a sleek, round smart display watch featuring high-quality steel material and a superb display hardware. Zenwatch comes with a stylish gunmetal, silver or rose gold bezel design and well appealing Italian leather strap with traditional three button style. Asus have evolved from their first two iterations of watch and 3 is the most worthy of your wrist. Even though it is priced at slightly higher $200, Zenwatch 3 is one of the best smartwatch choices in the market. Its features include a 1.39" AMOLED display, protected by Corning Gorilla Glass 3 and a stainless steel diamond cut bezel. It nicely syncs with your smartphone over a wi-fi and also supports a HyperCharge technology for quick-charge. 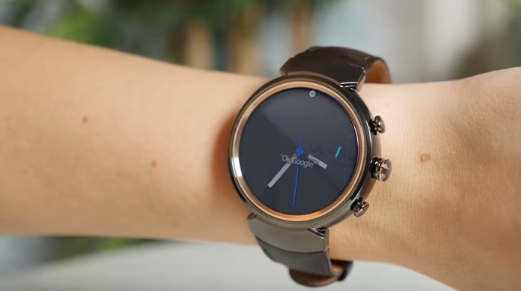 Watch has a latest Android OS-Smart Gesture Control OS which makes it easier and faster to scroll through apps, pages and much more. You also have a solid built-in micro speaker to conduct calls, hear voice messages and notifications.